On Monday, my husband had the day off work for President's Day. I suppose I don't get true "days off" from my job as a SAHM, but there are a few perks when my husband is home, and I try to enjoy them. One of those perks is [sometimes] an uninterrupted shower. I love showers. 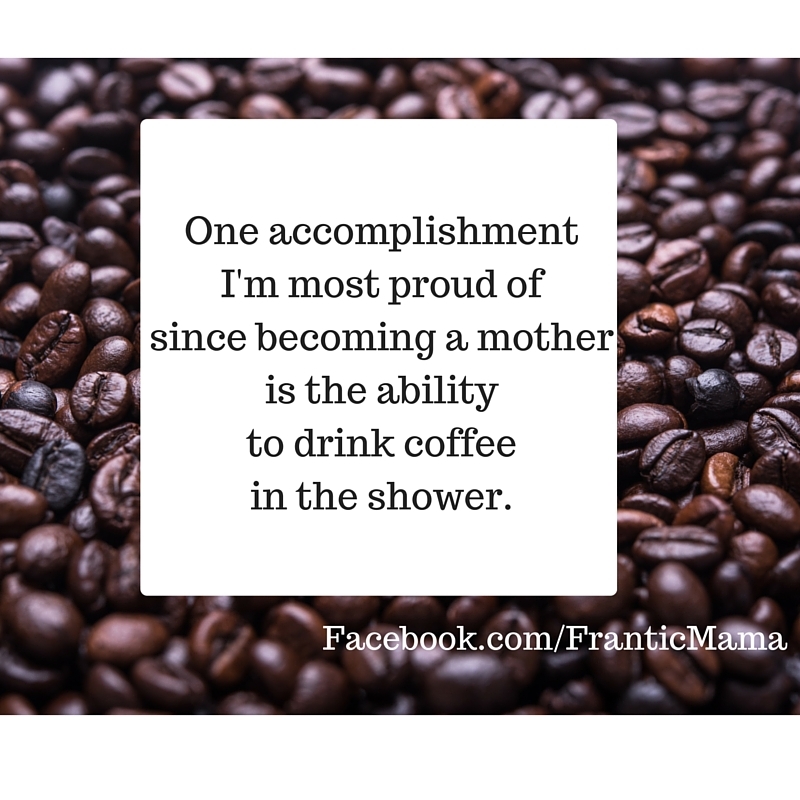 I do not forgo showers; I didn't even skip them too often when my kids were babies. I need one at some point in the day (the earlier the better) to feel like myself. I also need coffee every day to feel human and happy. 1. Tell the kids to please not kill each other (this is crucial). 2. Run to the best shower in the house with a hot cup of coffee in hand (be careful). 3. Two options: Place mug on countertop within reach of shower (and reach out to take your sips). If you have a longer bathtub-type shower style, the real badass move is to place mug on the bathtub ledge across from you, risking a bit of splashing into the cup. What stealth moves have you mastered since becoming a mom? Do tell! Be sure to Like and Comment on my Facebook page so I can reach more awesome readers like you :). (Facebook.com/FranticMama). Goodness! does it get any better?There are no rules when it comes to motherhood but there are definitely some very hilarious and witty axioms every mom will stumble upon and nod her head promptly ! you come up with such ingenious gems!! what could be pathos, you made laughter. What a knack!! it can not get any better. But it can! i know you will surprise! !And all of us will be shaking our heads , sharing motherhood and laughter. Ha ha!! Thank you for the laughs. "giggles"
"What could be pathos, you made laughter." Thank you! I really do try to find humor in every mothering situations. Otherwise it's just all too hard! You have got this 'mothering' thing!!! You inspire me all the time! What a relief laughter can be! And I regularly hold bed picnics. Switch on a show, fetch popcorn and fruit. As the kids watch and eat and maybe squabble , I ask them to pretend mamma has gone to camp and swiftly go under a duvet.And SLEEP for a good twenty minutes. My eight year old will set an alarm on his watch to know when mamma will be back! !Heavenly if you don't mind the crumbs !